The Pew Project for Excellence in Journalism generated gasps when it reported that newspapers are losing $7 in print advertising for every $1 of digital revenue that they gain. But the situation is even worse. In fact, publishers since 2005 have lost $26.7 billion in print advertising revenues while gaining only $1.2 billion in new digital revenue. Thus, the true ratio of print loss to digital gain is 22 to 1, not the 7 to 1 reported by Pew in March. My analysis starts in 2005, the best year ever for newspaper ad sales, when combined print and digital revenues were $49.4 billion. Industry sales have fallen unrelentingly since then to $23.9 billion in 2011 – the lowest point since 1984, according to the Newspaper Association of America. 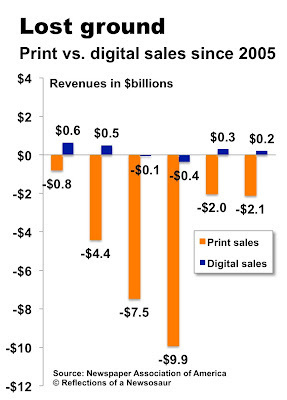 When you compare the industry’s sales performance from year to year since 2005 (as illustrated below), you see that print sales fall every time and that digital revenues advanced in four years but actually declined during the Great Recession in 2008 and 2009. 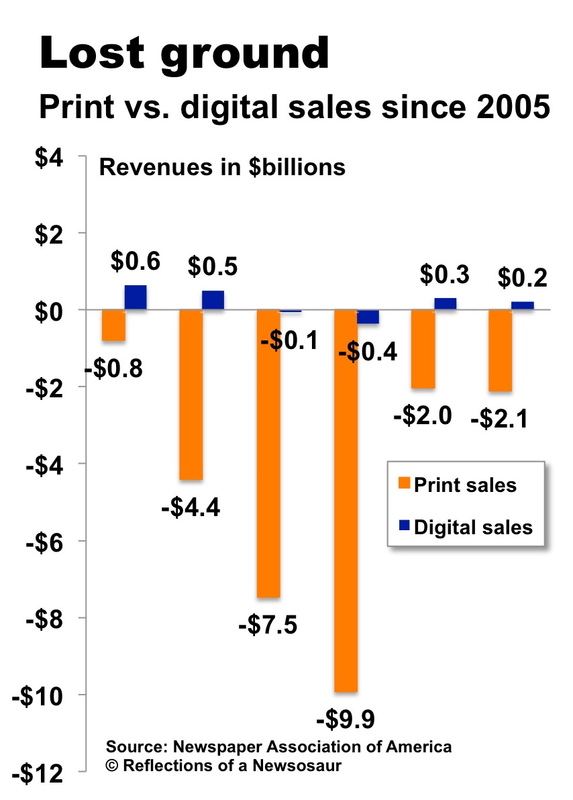 The net result is that $26.7 billion in print sales evaporated in the same six years that publishers netted $1.2 billion in new digital revenues. The difference between my findings and the Pew conclusions is that Pew only looked at the performance of newspapers in the last two years, a period in which most publishers put more emphasis than ever on building digital revenues to offset their print losses. While the long-overdue effort is welcome, publishers have a lot of ground to make up. Though digital revenues at newspapers have advanced 9.1% since 2005, the total online advertising market grew by close to 60% in the same period, according to projections based on mid-2011 statistics published by the Internet Advertising Bureau. Even though the final IAB numbers for 2011 have yet to be released, it is easy to see that newspapers have lots of lost lost ground to make up. It was obvious 6 years ago that that financial structure of Newspapers needed to be drastically altered. Unfortunately upper management at the majority of print publications were reluctant to pull the trigger on massive readjustments of the salary structure of the entire organization. Instead we had a trickle then a flood of layoffs that didn't address the underlying issue that the revenues were never going back to even half of what they were and the massive cutting was hurting the ability of the team to implement needed changes to the culture and digital distribution. We cut and cut but essentially kept doing the same job functions with some alterations here and there. What would've should've done it sit everyone down and say here it is. Our revenues are going to be "this" and our cost structure is "this". We have to fund our digital transformation which will cost "this". In order to just break even we will need everyone to take a 15-20% pay cut and we will still need to eliminate some positions. Also, all these comparisons I hear from people about how we compare to Yelp, HuffPo, UrbanSpoon, etc... are baseless. Those guys are lose more money than most print publications but can raise money we can't. Gawker is the only on-line only media entity I know of that is profitable on a consistent basis. So, is it to late or can we recover? That's assuming its necessary to get all that revenue back. I'm sure if you went back to 2001, it would look even worse. But what's the point? Ok, the biz didn't react quickly and has lost cash/opportunity/ground over the past years. Fine. How much and how deep is difficult to generalize across all media companies, isn't it? And what about subscription revenue? And services? ... Does this conversation even matter? I guess my point is that it's fine to look back ... but (at least in this case) it's not going to help move forward. Just get on with it. What will happen to our Democracy without an unbiased, responsible and professional press? This is powerful math, but it's overly simplistic. What else happened between 2005 and now? A deep recession, from which we have not yet recovered. That recession hit traditional newspaper advertisers particularly hard (big boxes, car dealers). Analysis requires more than just adding and subtracting -- it requires context. A combination of factors has created the newspaper revenue downturn, including the impact of digital and some dumb decisions by newspaper owners and managers. It's far more complex, Alan, than your numerical analysis suggests. I wonder when the last U.S. buggy whip manufacturer closed its doors in the 20th century? My recent experience on behalf of a client who is interested in making a series of major advertising buys in the country's top 50 markets has convinced me (well, to be honest, I already knew it) that newspapers are their own worst enemy. It is near impossible to find the right person at many major newspapers to discuss an ad buy (I don't run an ad agency and this project is ancillary to what I usually do). Often the only actual contact I could make with a real person was with someone in the classified department. Emails sent directly to publishers and / or advertising VPs and directors, when I could get their addresses, and calls made to them, were often unanswered despite multiple contacts. Some newspapers were standouts for the speed of their response -- The Washington Post, for example. But to date, almost three months after beginning this effort, I have yet to hear from anyone at newspapers in 20 of the nation's top 50 markets. It's actually easier to reach the editor in charge of high school sports coverage than to reach a sales representative with the authority to discuss a major buy. Maybe newspaper publishing companies should start recruiting their publishers from Target, a company that understands the importance of customer service, instead of promoting them from within! Roger -- just wondering how things are stacking up in Idaho Falls, an isolated metro market -- versus, say, Boston, the mega-metro market where I live. What toll has online classifieds taken on the Post Register? Do you have Craigslist to contend with? What about auto and real estate lineage - are they down in your market by the same ginormous margins that large metros are experiencing? Not that the picture is very pretty anywhere - I'm just trying to see if the gloom doesn't run six miles deep everywhere. Not only do we have Craigslist, but KSL.com from Utah is a heavy hitter here. Revenue is down from its peak in 2005, but the fall stopped last year and we're now on a modest upward trend. This will be the third year of increased revenue in classified for us, despite the free sites. It turns out, we don't accept ads for prostitutes and we screen for fraud and other mischief. What a concept. I do think "community" newspapers (under 50,000 circulation outside metro areas) are in far better shape than the metros for a variety of reasons. It's tough sledding everywhere, though. My point wasn't that there aren't significant challenges; my point was that Alan, g' bless 'im, did some incomplete analysis. Ah, swell. Academia weighs in. Neither clever nor insightful. Rick Suber's buggy whip question is especially appropriate when it comes to a discussion of the newspaper business. As we all know, buggy whip manufacturers went out of business when the automobile was introduced. What they failed to realize was that they weren't in the buggy whip business -- they were in the business of manufacturing accelerators. So when a new type of vehicle came along, they should have shifted to build accelerators for it. Similarly, newspaper publishers have failed to understand what business they are in. As a consultant to the industry, I usually ask a client upfront what business he or she thinks he is in. Most say "the newspaper business." Some say "the information business." I would argue that both answers are wrong. Newspaper publishers are in the business of aggregating audiences on behalf of advertisers. When one starts thinking of the business that way, many opportunities come to mind. Certainly one way to aggregate an audience is to produce a well-written and distributed local newspaper. But if you already have a well-known brand and a sales staff, why not aggregate in other ways? The St. Petersburg (now Tampa Bay) Times did that by launching tbt* a free daily aimed at young people. And it modified its website content to aggregate an audience that wasn't reading the print newspaper. Why not also strike a deal with local nightclubs, which aggregate young audiences, to project cool videos made for advertisers on the club walls or distribute product samples to clubgoers? (Richard Branson used to do this at a club he owned in London). Or put on a beerfest on a downtown street (which an Atlanta newspaper for which I worked did with great success). Or strike a deal with local movie theaters to create and project local ads on the screens before each movie begins? The possibilities are only limited by one's imagination. And a publisher's imagination is very limited if he (or she) continues to think he's in the newspaper business. In a world where readers can find news for free on Twitter, Yahoo and sites such as CNN and NPR, newspapers have yet to answer the question: what can we offer in a digital age. This, not salary structures, is the crux of the issue. If online advertising won't pay the bills, then we need more paywalls as well as an incentive to pay for the news we get digitally that we have been paying for up to now when it landed on our doorstep. I still find superior writing on the sites of major newspapers to that supplied by bloggers pretending to be journalists or by Yahoo pretending to be a news service. Yet, I'm seeing it for free and, goodness knows, ads for local services on the far side of the country aren't attracting click-throughs from me. Online digital products in combination with print ads can pay the bills with the right structure in place. Unfortunately staff editorial has to shrink even more in conjunction with the heavy use of freelance, similar to what the profitable Gawker does. We are still relevant locally and we have to protect and build on that. If we can build up a big enough base of local companies that purchase digital products from us, note that I said digital products which encompass more than just banner ads, the bigger ad networks and agencies that want to geo target will be much more receptive to our sales pitch. I believe we have to focus on the niche where we can excel which is local. We won't get 30 million users with this strategy but we would be profitable and still provide a valuable service to our local communities. The question I would ask is, "Did the advertisers' expenditures stay the same, grow, or go down?" Depending on the answer, you are looking at the issue from a closed-system perspective in which the print/digital publishers are the only game in town. In fact, they are being replaced by alternative digital venues for advertising. A significant sidebar point is that there doesn't seem to be any evolution of a replacement for the authoritative content side of print publishing, just for advertising. It's hilarious when dinosaur print editors wait around (again, still), this time for the recession to be over, so they can reclaim their business model. Not. Gonna. Happen. Stop the navel gazing and develop a business model to support professional journalism that isn't advertising supported. Typical. No one -- no one -- is advocating the reclaiming of an outmoded business model.